I always feel a little bit like a goofball sending out a Christmas card as a single woman. I mean. I don’t have a husband with interesting stuff going on in his life. I don’t have kids. I don’t even have dogs of my own to take pictures of. 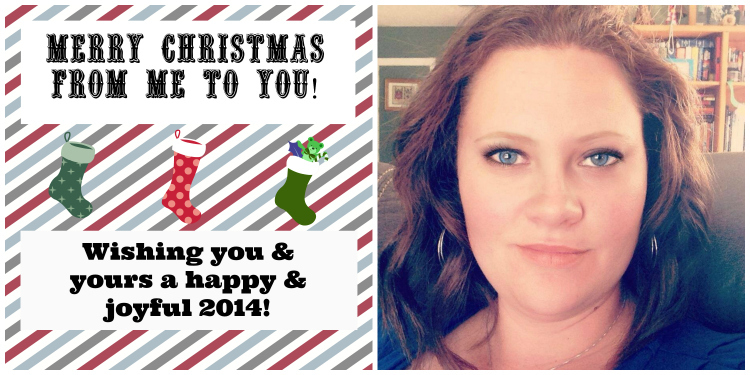 So this is my Christmas card to you and a recap of 2013 (because I’m failing at my goal of blogging once a week throughout the rest of the year!). 1. I feel like it’s kind of blurry but I tried so hard to make it not. Oh well. 2. It’s incredibly difficult to put yourself, alone, on a card without feeling kind of like an idiot. Oh well. Laughing at myself. Gone Girl was so crazy and mind-trippy and AWESOME. I also like Flynn’s book Sharp Objects; however, I avoided Dark Places because of some issues that weirded me out and I later found out it has elements of Satanic worship in it. 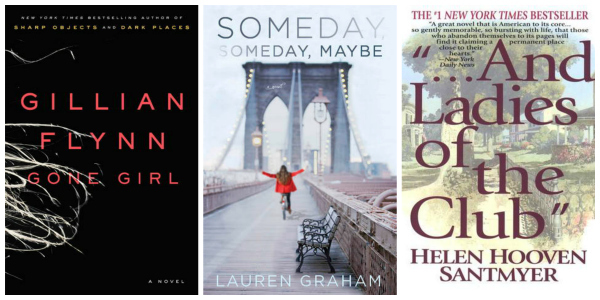 Someday, Someday, Maybe is the debut novel of Lauren Graham (yes… my beloved Lorelai Gilmore) and I loved it so much. I can’t wait for her second book! I would recommend …And Ladies of the Club to anyone who enjoyed Gone with the Wind. I feel lucky enough to get to be an ongoing part of this wonderful little girl’s life. She is so funny and makes me laugh incessantly. The joy she brings to my life is unending. She finished third grade and started fourth this year. She excels in pretty much everything she does (two awards this year for writing/language arts!) and is doing so well at swimming. I love watching the person she is becoming – she unfolds a little more each day and she’s amazing. She is a compassionate little person who loves animals. Her tender heart moves me. There aren’t enough words in the English language to describe how I feel about her! I was blessed to receive a fantastic job in May at the church I attend. I had been working for a tax firm with a friend and knew my job was going to come to an end the day after my 30th birthday. I tried, in a sudden moment of panic, to take things into my control but God had other plans for me. I’ve been here almost eight months and I can’t believe how fulfilled I am at the end of every day. There are moments where I think, “Yeah, I got this. I’m a pro at this job!” and I get all caught up in my own strength and pride and God humbles me massively. He is so good and has been so good to me this year! Well, I couldn’t let this card go without mentioning my furry loves! In January, my family adopted a Rhodesian Ridgeback puppy who was 12 weeks. She is currently just over a year – she is our wonderfully crazy Penny dog (known by a zillion nicknames, including Pennifer, Penny pup, Penny pooch, Pen-pen, and ding dong). Sadly, not long after we welcomed her into our family, the painful, heart-breaking decision was made to put Baytor down. She had a degenerative nerve disease that caused the quality of her life to drop rapidly, and she was suffering and in pain. It would have been selfish for us to hold onto her simply because we weren’t ready to let go. She will never leave our hearts – our So Big made a lasting impact on all four of us. I am so thankful for the opportunity to spend thirty minutes the night before lying with her on her bed, petting her and telling her how much she meant to me. I cried and I snuggled her for that last time. It was so special. She was put down on February 22 – and little did we know, on February 21, a tiny little rottie who would come into our lives was being born. That dog came to us six weeks later and she is now our 10-month rottie named Pepper. At first she reminded me so much of Baytor, and that was both comforting and sad. But now that’s she’s nearly full-grown, she is different different different! She is a fully, happy pup and I love that she rounds out the trio. Chole is still here. She still has no front teeth and thinks she’s the queen dog. She loves to snuggle (currently she is right against me as I type!). I love this wonky, wacky, weird pack of dogs. That’s all she wrote! 2013 was a good, good year. I can’t wait to see what 2014 brings me way!